Lyric Opera is drawing to the conclusion of their 2016-2017 series with a new production of George Bizet’s classic opera about out of control passion, Carmen; an opera containing some of the most well-known melodies and loved by many. When it premiered at the Opera Comique in Paris on March 3, 1875 it was considered one of the most scandalous operas to ever be performed and, seeing it again made me realize why. Carmen is what I refer to as a down and dirty opera that generates from the groin; it is hot blooded, Spanish and as seamy a story as any found in romance fiction today. Carmen, a Spanish gypsy who men find devastating, works in a cigarette factory in Seville, Spain occupied with soldiers. A young girl, Micaela (in one of the strongest, most well-rounded performances of the evening by Eleonora Buratto) is in love with a Spanish soldier, Don Jose, and has come with a message from his mother telling of her approval of Micaela as a wife for her son. Being the dutiful son he tells her he will follow his mother’s wishes. The bell rings inside the factory signaling a smoke break for the girls where Don Jose meets Carmen for the first time and instantly falls in love with her. Carmen teases him by tossing a flower at him before going back into the factory. Shortly screams are heard in the factory and the girls run out asking the soldiers for help. Carmen has slashed another girl across the face with a knife, a foreshadowing of things to come. Carmen is arrested by Lieutenant Zuniga (superbly performed by Bradley Smoak) and he tells Don Jose to lock her up. She pleads with Don Jose and offers him her love if he will let her escape, which he does. Now considered a traitor by his men, Don Jose is forced to leave his regiment and he runs into the mountains with Carmen. Six months has passed and she has grown tired of her controlling new lover and wishes to be rid of him. Being a gypsy and superstitious she draws cards from the pack to let her know of their future and comes up with the death card; she realizes that Don Jose will be the end of her. Glamorous bullfighter Escamillo, (in an outstanding comical performance by Christian Van Horn who possesses a velvety bass-baritone voice rich in tone) enters and Carmen is immediately attracted to him, which enrages Don Jose, threatens to kill her if she leaves him. In the final act, which takes place at the bullfighting arena where Carmen is waiting for her new lover, Escamillo when she is warned about Don Jose being in the crowd. Carmen, unapologetic and unafraid, laughs this off. After the crowd has gone inside to witness the bullfight Don Jose approaches Carmen and pleads for her not to leave him. Carmen, although still very much in love with Don Jose, does not want to be controlled by any man at the cost of her freedom, and rejects him again. Since he can’t have her he kills the only thing he has ever loved and the curtain falls with him weeping over her dead body. The libretto by Henri Meilhac and Ludovic Halevy combined with Bizet’s lush, passionate and memorable score makes a compelling opera; it is intimate in scope and gets lost in vast spaces. Director Rob Ashford’s inspiration for Carmen derived from a famous Picasso painting “Guernica” which he translates into his conceptual design. He has also moved the action from 1875 to the Spanish Civil War of 1936-37 where fascists attempt to overthrow democracy (quite timely and relevant with what is going on in America at present with the demonstrations). Rob Ashford’s concept unfortunately comes off passionless and unengaging in the much acclaimed Lyric production, lacking any true passion. If fact this is the most passionless production of Carmen I have seen. I never got the feeling that Ashford really understood the through line of the opera and that Carmen was a woman capable of intense love and does love Don Jose. However her Achilles heel is that she is largely a character who does not want to be controlled by passion or love. It appears that Ashford has directed his Carmen (sung beautifully by Russian mezzo Ekaterina Gubanova) to remain distant and aloof which limits the complexity of his heroine and completely undermines her character development, making for a shallow and clichéd characterization. It is apparent that Gubanova is highly capable of delivering such a Carmen but her hands appeared to be tied and, as a result, she just wanders across the stage striking poses, fanning herself and falling into the trap of every cliché of a heartless and cold Gypsy prostitute. In the role of Don Jose baritone Joseph Calleja does not fare much better, only acting from the head; his body and gestures are largely stiff. It is apparent why the Lyric engaged him as his voice is one of the finest tenor voices in opera. However he appears lost at times and director Rob Ashford has not done him any favors when staging his big aria where he confesses his love for Carmen “La fleur que tu m’avais jetée” with him downstage facing out and her lying upstage directly behind him on a table with her back to him. 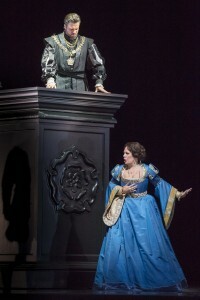 Much of the problem with the lack of chemistry between Gubanova and Calleja lies in the fact that they are seldom singing to one another but always facing out and at separate places on the stage; they cannot and do not connect for much of the evening. The scene in Act two with the revolutionary Gypsies singing about the gypsy way of life, Dancaire (Emmett O’Hanlon), Remendado (Mingjie Lei) and Carmen’s good friends Frasquita (Diana Newman) and Mercedes (Lindsay Metzger) works very well and all four give delightful performances. I also must fault the set design by David Rockwell as being one of the most singer unfriendly designs I have recently seen in opera, most apparent with the dramatic final act and layout of the entrance to the bullfighting arena where the singers are forced to play out because we lose their voices if the try to face one another. The result is a highly unnatural, look front and deliver staging of an opera that demands a highly naturalistic approach and visceral connection between the main players. Ashford’s production is highly presentational which works completely against Bizet’s score and the action of the libretto. I will credit him with the wise choice of translating many of the recitatives which are sung into a naturalistic dialogue, making the opera more accessible to non-opera goers. Julie Weiss’ bland costume design is largely devoid of color and reinforces the passionless world of Ashford’s vision, lacking in individuality of characters by having all of the women in the cigarette factory in variations of the same black dress. In contrast Donald Holder’s lighting design is Technicolor and provides the scorching heat and vibrancy which should have been carried through the rest of the design. As always the Lyric chorus was in outstanding form and produced a tremendous wall of sound in their crowd numbers. Likewise the Lyric orchestra under the baton of Harry Bicket played Bizet’s score with passion and urgency. Choreographer Rob Ashford states in his notes of the important role of the dancing in Carmen and his dancers and choreography are top notch. However I often found them to be distracting, especially when they mirror the action of the main couple, thus creating a further barrier to the intimacy of the story, drawing the eye away of action that should take precedence. I think that Rob Ashford’s idea of making his Carmen more theatrical and less operatic is a wise move for engaging newer opera patrons. In fact this is the perfect opera for a new opera-goer. However much of it did not translate or form a cohesive whole. As a result we are given a mixed bag of ingredients instead of a fully baked vision. 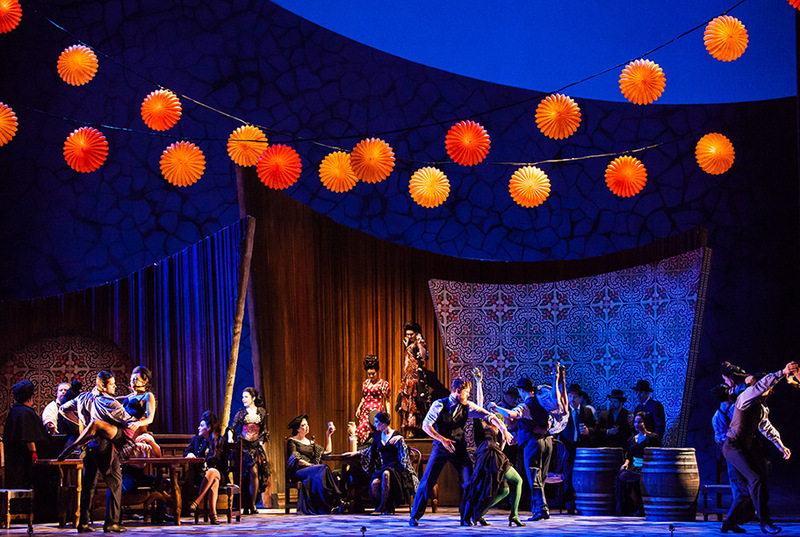 Carmen runs at Lyric Opera of Chicago through March 25th. Tickets are available at www.lyricopera.org.